"Magnolia Blvd. 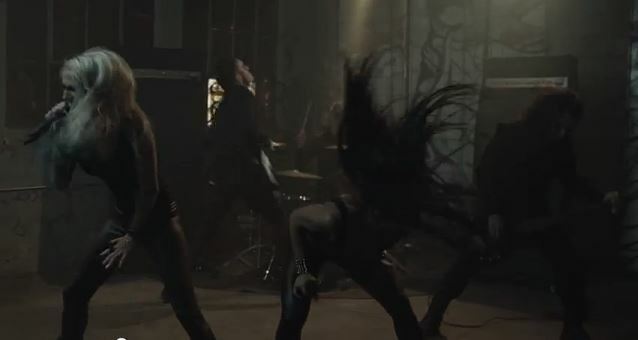 ", the new video from BUTCHER BABIES, can be seen below. The clip was directed by Daniel Andres Gomez Bagby, who has previously worked with BUCKCHERRY. "Magnolia Blvd." comes off BUTCHER BABIES' debut album, "Goliath", which sold around 3,300 copies in the United States in its first week of release to land at position No. 107 on The Billboard 200 chart. The CD came out on July 9 via Century Media Records. The Los Angeles-based band — frontwomen Carla Harvey and Heidi Shepherd, guitarist Henry Flury, bassist Jason Klein and drummer Chris Warner — wrapped its tour with MARILYN MANSON in late February and went straight into the studio with producer Josh Wilbur (GOJIRA, LAMB OF GOD, HATEBREED). In a recent interview with CrypticRock.com, Shepherd stated about "Goliath": "The album, as a whole, is very diverse. There is basically something for everybody. We all have different influences and everything is portrayed on this album. Jason [Klein, bass] loves death metal; Henry [Flury, guitar], in general, metal; I love nu-metal; and Carla loves classic metal. We all love every [kind of] metal but those are our favorite and those are where we came from. All our influences shine bright on this album. It's definitely a coloration of everybody's influences and everybody's love. We're all very proud of it in one way or another. There is something for everybody in it."